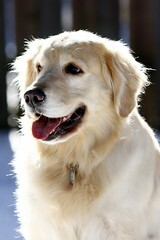 your daily dose of Golden Retriever news, info, and cuteness! Does Your Golden Retriever Drool? 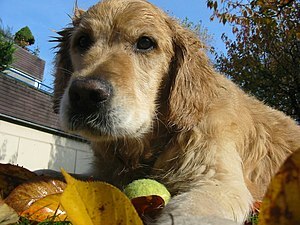 Generally speaking, golden retrievers are very food motivated dogs, and as a result, sometimes are overweight. They eat ravenously and have a bottomless pit for a stomach. Tucker likes to watch us eat, but when we eat certain foods, (usually bacon or pizza) he will often drool. Lots. Drooling while humans eat is one thing, but keep in mind that excessive drooling can be caused by a number of other reasons. For example, drooling in the car is usually a sign of nervousness. Sudden, unexplained drooling could mean an injury to the mouth or irritation of the gums or even a symptom of poisoning. Consult your veterinarian ASAP if this happens. Why is My Golden Retrievers’ Nose Turning Brown? There are actually a few reasons this may be happening. Some say the brown nose is called a “snow nose” and it is caused by the cold weather. My previous golden, Logan, never had a brown nose. We live in Ontario Canada and the winters are fairly cold. I have seen pictures of goldens in warm climates with brown noses too, so I realized this isn’t the only reason for a dogs’ nose to change color. There is also a possibility it could be caused by using plastic food and water bowls. I hope you found this information helpful. I know we love our goldens no matter what color their noses are. According to on.AOL.com, Dr. Doug Kramer, aka “The Vet Guru” of Chatsworth, CA passed away on Thursday Aug 22, 2013. He was only 36 years old. So far I haven’t been able to find any information on the cause of death. His obituary doesn’t specify, but does request donations be made to a cancer organization. Dr. Kramer was a pioneer in medical marijuana for pets suffering from pain and/or cancer. He has been featured on pet friendly sites like Dogster and Paw Nation. I’m sure he endured a lot of criticism for his efforts. Personally speaking, I think it is a terrible loss, and hope that others take up the cause and continue to pioneer the research into this controversial “wonder herb” as it pertains to animals. I did a blog post on Dr Kramer “Would You Use Medical Marijuana For Your Golden Retriever?” back in April of this year, including a poll. 93% of the voters (at the time of this post) say they would consider using it if their pet were suffering. While you are here, why don’t you vote..
Dr. Doug’s last tweet was on August 16. Thanks for your efforts, Dr. Kramer. A reader commented on my post On Cancer and Spaying or Neutering Your Golden Retriever and I thought he raised a few good questions. Was wondering if anyone had any advice for him. I have only owned male goldens, so I can’t offer any personal advice. I am currently fostering a 7 yr old golden who supposedly was a breeder dog. In order to go ahead and adopt her. ( She had some health issues we were fostering her for), she also needs to be spayed. My questions are 1. What are the risks at this age ? 2. Does she really need to be spayed from a health standpoint since she will be staying with us forever at this point. Do dogs still go into heat at this age? Some points are we have other dogs and everyone including the golden get along perfectly by the way. I guess my main question is is that is it worth the risk to get her spayed for the sake of getting her spayed? Does anyone have any advice for Mike? Carrboro, NC – I realize that there are many stories in the news of this happening, but apparently it is still not hitting home with some people. The temperature outside is not relative to the temperature inside a vehicle, and it only takes minutes to reach temps over 100 degrees even when its only 75 outside. On June 10, Deb Cunningham learned this lesson the hard way. Deb is a program director at an organization called Eyes, Ears, Nose and Paws. They are a non-profit organization that trains and places service and diabetic assistance dogs. On that particular day, Worthy, a 2 year old golden retriever, was suffering separation anxiety so Cunningham took him to the office. Worthy had completed his training and was scheduled to be placed with his new client the following week. Because it was only 73 degrees and she parked in the shade (at high noon with the windows up) Cunningham thought the dog would be fine in the car. Worthy was left in the car to avoid upsetting him as his foster mom was attending the office that afternoon. 2 hours later, when Cunningham returned to the vehicle, Worthy was unconscious and panting. When she arrived at the vet his temperature was 109. EENP Executive director Maria Ikenberry says the car was “not hot” when they discovered Worthy and that he was probably anxious and ran circles in the car and overheated. Sadly, Worthy suffered cardiac arrest and died the next day at Triangle Veterinary Hospital. The organization is considering disciplinary actions against Cunningham and The Carborro Police are investigating a charge of animal cruelty. R.I.P Worthy. Here’s a video of Worthy from the EENP Website. Golden Retrievers are known to be tick magnets. 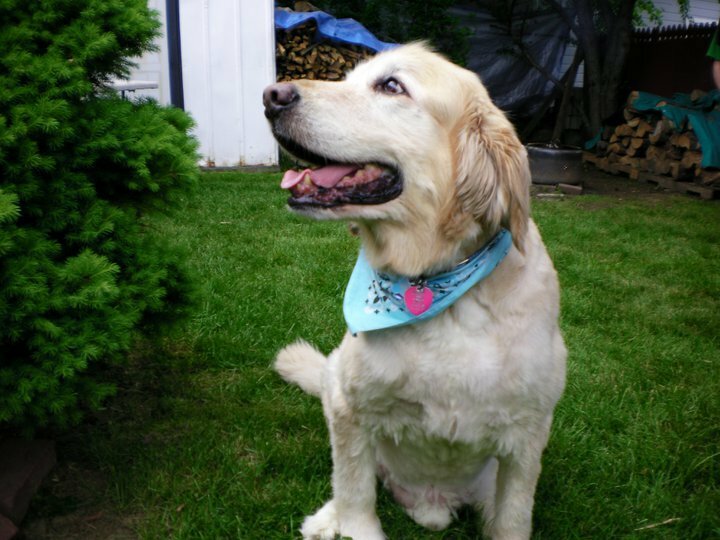 Some say ticks are more attracted to lighter colors, and a golden’s long fur is a great place for a tick to hang out and hide. Due to factors like milder winters, an increase in white tailed deer, and fewer insecticides being used, 2013 is being predicted as a record year for ticks. Ticks are a problem for animals and humans alike. Tick species vary by location, and different species carry different diseases like Lyme Disease, Ehrlichiosis and Rocky Mountain Spotted Fever. Check your dog for ticks every time you bring him/her indoors. Visit your veterinarian every spring to discuss flea/tick and heart worm prevention medications. There are shampoos and collars on the market that deter fleas and ticks. So you have found a tick on your dog. First, you must remove it with tweezers or a Tick Twister. It is not recommended that you burn it or suffocate it off with any type of substance, as this can cause the tick to inject more saliva into you or your pet. Then clean the area with an antiseptic and put some antibiotic ointment on the site. If your dog has been bitten by a tick, watch for signs of illness including stiffness, loss of appetite and lethargy. 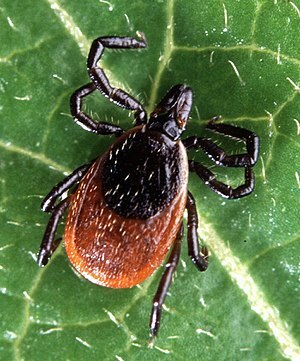 Contact your veterinarian right away if you suspect your dog has a tick borne illness. Keep in mind these illnesses can lay dormant for several months before showing signs. Would You Use Medical Marijuana For Your Golden Retriever? So your golden retriever has just been diagnosed with cancer and is very weak and lethargic, and in a lot of pain. 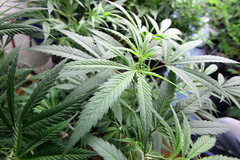 If you knew there was an option to ease pain and increase appetite in a safe, chemical free way would you consider it? What if that option was marijuana, what many consider to be the root of all evil? Marijuana is now legal in over 20 states in the U.S. and has been proven very effective for palliative care in humans, as well as treating many other illnesses. 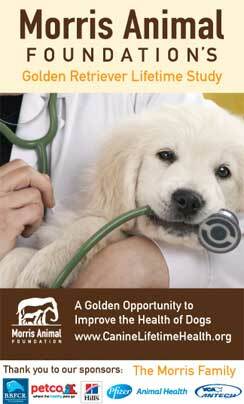 If your golden retriever suffers from arthritis, there is a fairly new procedure that may be an option. Stem cell treatment is far less expensive and invasive then joint replacement surgery. Stem cell therapy involves taking stem cells from a part of the dogs’ body, harvesting them and re-injecting them into the affected area. Depending on where you live the procedure costs around $2000. According to the following article, results are almost instant. Here is a great article provided by TheDogMaOnline.com about the benefits of an alkaline diet. Why Should Your Dog Be Alkaline? How Does an Alkaline Diet Affect Cancer Cells? Studies have shown that in the test tube, cancer cells and tumors thrive and grow in a more acidic environment. When the level of acid is lowered, tumors grow much more slowly. If this behavior occurs in the test tube, it stands to reason that cancer cells in the body would also be detrimentally affected by an overall alkaline environment. It would also make sense that if the body’s pH is acidic, then the growth of cancer cells and tumors would be encouraged. By eating mostly foods that make the body’s pH more alkaline, there would be less of a chance for cancer cells to develop and grow. So, by adjusting the diet, it is actually possible to create a less hospitable environment for cancer cells, thus improving a person’s/dog’s chances of experiencing good health. Proper pH Will Improve Your Pet’s Quality of Life. Tissues in the body are prone to disease of all sorts, including cancer, if they become deficient in oxygen. To understand why, it is helpful to understand the nature of acidity and alkalinity. Cancerous tissues are acidic, where healthy tissues are alkaline. Water (H2O) taken into the body eventually breaks down into H+ and OH-. When a solution contains more H+ than OH- it is acidic. When it contains more OH- than H+ it is alkaline. When oxygen is introduced into an acidic solution it will combine with H+ ions to form water. Oxygen helps neutralize acid, but acid also prevents oxygen from reaching the body’s tissue. Acidic tissue is devoid of free oxygen as tissue needs oxygen to remain healthy. The pH scale ranges from 1 to 14, with 7 being neutral. Below 7 is acidic and above 7 is alkaline. The blood, lymph and cerebral spinal fluid in a dog’s body are designed to be slightly alkaline at 7.0 – 7.5 (6.1 – 6.4 for cats). At a pH slightly above 7.4, cancer cells become dormant and at pH 8.5 cancer cells will die while healthy cells will live. The following list indicates which foods are acidic and alkaline. The left side of the chart indicates acidic foods, or foods that are more harmful. The right side of the chart indicates alkaline foods, or foods that would be most beneficial. It is important to understand that we are not talking about stomach acid or the pH of the stomach. We are talking about the pH of the body’s fluids and tissues, which is an entirely different matter. Kibble Formulated To Be Alkaline based. Canine Caviar Chicken and Pearl Millet ALS Dinner 12 Pound is a complete and balanced kibble formula intended for moderately active dogs, growing puppies, and breeding animals. Chicken and Pearl Millet ALS Kibble is the most nutritious food your dog will ever need and is the ideal diet for large and giant breed puppies. This kibble is the only food in the USA formulated to be alkaline based. Cancer cells can not grow in an alkaline environment. Perfect for large- and giant-breed puppies! • Reduces amount of oxygen in the blood. • Cancerous tissues are acidic and devoid of oxygen. • Leaches calcium from bones & is released into the kidney, resulting in stone formation before being excreted. • Acidosis is excessive consumption of protein, which is metabolized “acidically” because of sulfur content. • Without enough oxygen the DNA self-repair mechanism will not function causing free radical damage. Buy A Golden Retriever Chalkboard and Give Back! Golden Retrievers and "Paw-resting-on-arm" Behavior. Dominance or Not? Lost Golden Retriever in Dublin, Georgia – Can You Help Bring Moose Home? Golden Retriever Lost for 20 Months is home Safe! Ice water, is it really a problem? A way of life through the eyes of Ziggy. photography. dogs. peanut butter. pictures of dogs eating peanut butter.